Well this episode blew away any expectations I had for it going in. I think they did a really good job exploring just what happened to Rin and Rani over the past millennium and why they desperately needed Hakuno to make it up to that floor. A lot of questions I had about their motivations and actions were explained in this episode. I get why they were so willing to help Hakuno and also why they kept appearing or disappearing. Rin didn’t need to get involved on the second floor with Blackmore because Rani had that covered. It also makes sense why Rani appeared despite appearing to die, because there were multiple copies of Rin and Rani. It may have taken time for another copy of Rani to make her way down in order to meet up with Hakuno and Nero on the floor Julius was on. I love how this show manages to take elements from the game and yet come up with an original story. Hakuno was left with a difficult dilemma when it came to killing either Rani or Rin. A similar dilemma left for the player to wrestle with in the PSP game. What I like is that Hakuno takes a path that is uniquely available to him. Despite being a Dead Face, he chose the path of life. He wanted to save Rin and Rani from their situation. Even if it might have meant they would have to fight anyways in order to advance. It was thanks to those two that he and Nero got this far. He had an emotional connection to the two of them and he couldn’t and wouldn’t just choose to kill one of them while they slept. That kind of thing is exactly why I like Hakuno as a main character. People call this guy cardboard? Yeah he started out as a very blank slate, but that made sense considering his origins. Hakuno has grown, developed, and fleshed out his character through his experiences. Through that he has become a person who can face that kind of difficult decision and make a choice that aligns with his own beliefs. He isn’t the mindless embodiment of death that Twice may have thought him as and he’s not the bland protagonist people may have thought of him as at first glance. The whole point of this guy’s character is becoming his own unique self. 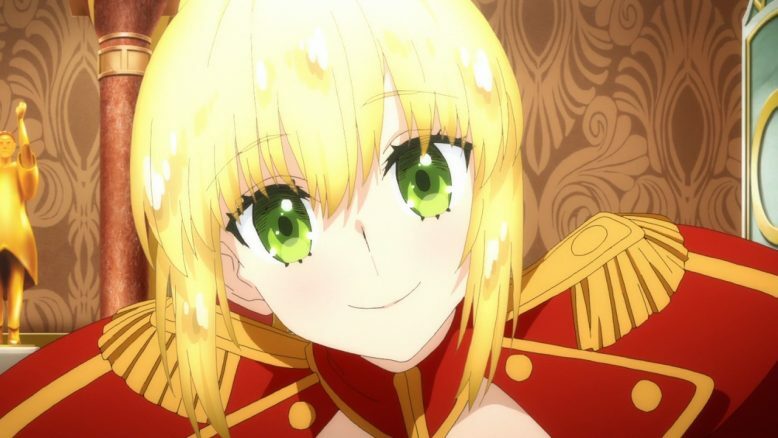 That is what Nero sees. The situation Rin and Rani found themselves in was utterly tragic. Their battle couldn’t reach a conclusion and therefore…they were stuck. The consequences of that draw were more horrifying than I could have imagined. It makes me think back to the game itself and how they use similar elements to an interesting end. Their fight couldn’t be resolved and therefore they were used themselves as cogs in the machine. They became both the floor master and the floor itself. Their battles continuing in a mass produced horror show. As their true selves slept they fought over and over and over again. 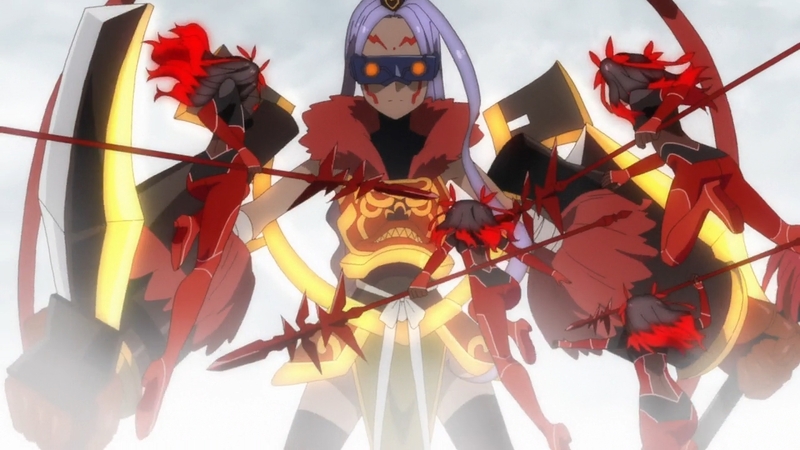 Turning effectively into demi-servants and just slaughtering each other. The true versions of them couldn’t stop it and only the copies themselves were truly conscious. It really feels as if they had no other choice but to try and find a master that could shatter this never ending hell. They sent copies down to the various floors looking and waiting for a master to rise up. Rin taking on the first task of saving Hakuno on Shinji’s floor and the two of them guiding their personal salvation upwards. Even if it meant one of them or maybe both of them would die, they’d rather take that option than continue onward. No wonder they were obsessed only with finding a master that could make it to their floor. It was pointless if the person didn’t have the strength to get past Julius and the other floor masters. Rani’s talk about waiting for all that time now makes sense. That copy of her must have been waiting on that floor for their salvation to come. The action in this show isn’t great, but I find it passable. Watching Rani and Rin clash against each other was something. You didn’t need an over the top action scene just to get the picture of the hellscape that floor was. Those mass produced soldiers just being mindless attackers that went after each other as a priority, but would attack anything that moved. This wasn’t a situation that Nero could just fight their way through. Maybe she could handle herself for a while, but the numbers would become too much. Even her noble phantasm wouldn’t have a point in a situation such as that. I do like as well seeing Hakuno growing and using his code casts with improved precision. He did what he could both to support Saber and get them through that situation. It is sad that Rani passed on, though I think she found peace in it. You can tell from the flashbacks with a previous incarnation of Hakuno that she wasn’t exactly a normal person. So maybe it makes sense that the attempts to revive and stabilize Rani failed. 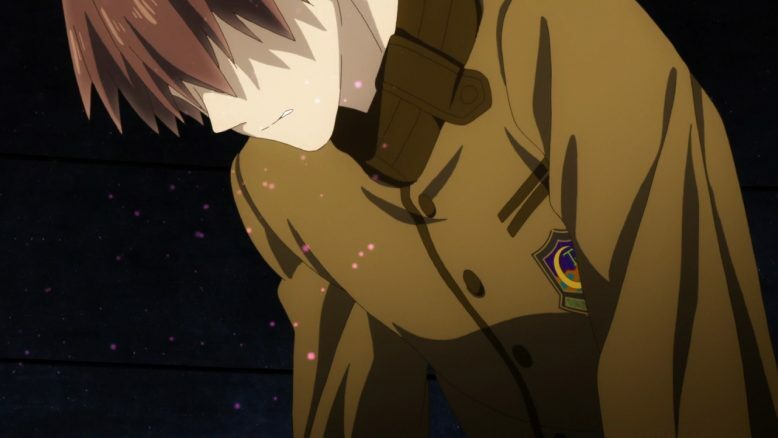 I did initially think that Hakuno chose to save Rin, but I’m glad he considered trying to help both of them. Failing to accomplish something doesn’t mean the intent behind it was meaningless. Hakuno tried to save the both of them and Rin won’t forget that. I like that she’ll do everything in her power to support Hakuno going forward. She feels the weight of what he did for her and Rani and will make sure to pay him back as best as she’s able to. The flashbacks themselves were good though. It was a solid means both to delve into Leo (the chess guy we met in episode 1), but also Rin and Rani’s backstories. You really didn’t even need more than one episode for this floor because we’ve gotten to know Rin and Rani bit by bit as the show went along. 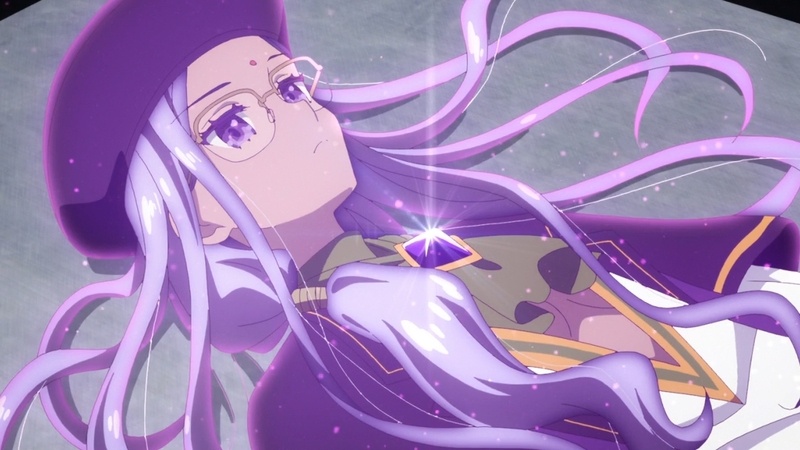 I kind of like the idea of Rin being this kind of freedom fighter who came up to the moon to take down someone she thought as a threat to the future of humanity and its ability to grow. Sadly it all becomes somewhat meaningless considering what we know about the situation on Earth right now. But it makes sense for Rin to continue on. If that Leo guy is still alive then she’d have a reason to be on the side that is against him. 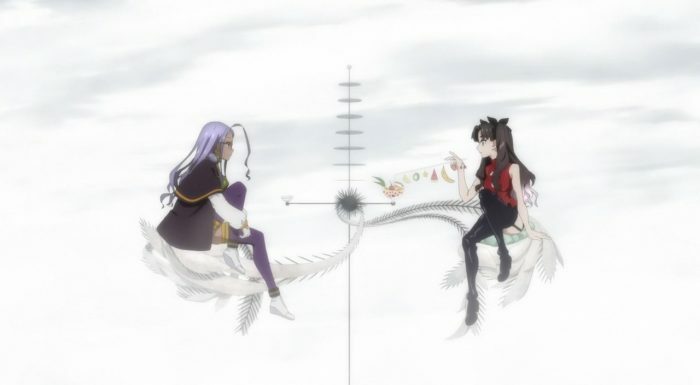 Sadly this appears to be the last episode review I’ll be doing for a while…Shaft being shaft isn’t going to be finishing the show until July. At least we’re not taking a break on a bad note. The battle on this floor and the attempt to save Rin and Rani from their horrible fate made for a strong episode. Honestly it was one of the better ones for me in the season. 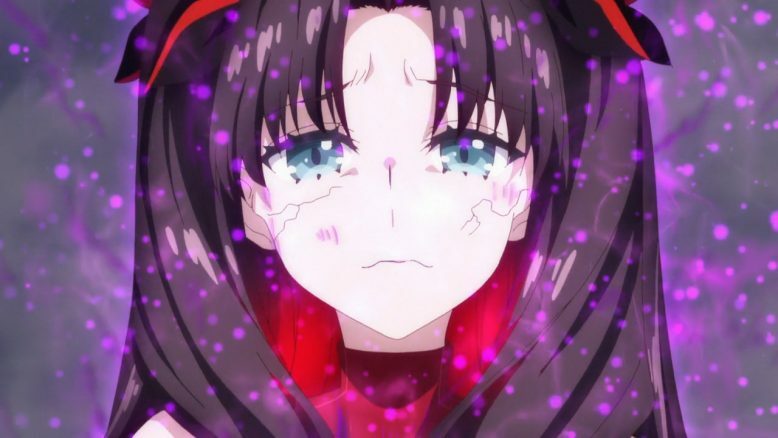 It is just frustrating that we’re not going to see how things end for Hakuno, Nero, and Rin for a long while. I can’t treat this as the last episode because it isn’t. So will just say ‘till next time’ and we’ll see how this story wraps up after the spring season. On a more positive note and it goes without saying…Nero is an adorable character. She knows Hakuno has a lot on his mind, but she openly acknowledges how much she enjoys hearing praise regardless XD.